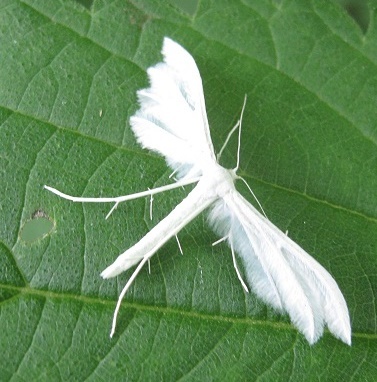 The most striking and beautiful of the plume moths, larger than the others and pure white. The forewings are clearly separated for half their length when the moth is perched. Often disturbed by day when its ghostly appearance in flight and when perched is unmistakable. At night feeds on valerians. Double brooded, March - August.